C'mon, you were thinking it too. While no other details have been announced, Zynga revealed in a forum post recently that CityVille will soon be able to support Factories. But like we said, as to what they'll do we have diddly squat. Come to think of it, doesn't Social City by Playdom have a similar feature? Why yes--it has the exact same thing. As similar as the two games are starting to look (a total coincidence, I'm sure), it's doubtful that Factories will be the same in CityVille. Zynga already has Businesses to make mayors their coins and Franchises to extend those Businesses. However, supplying Businesses one by one can be a total pain. This is purely speculation, but Factories could be a way to supply all of our Businesses either simultaneously or automatically. Regardless, it looks like we'll see shortly. 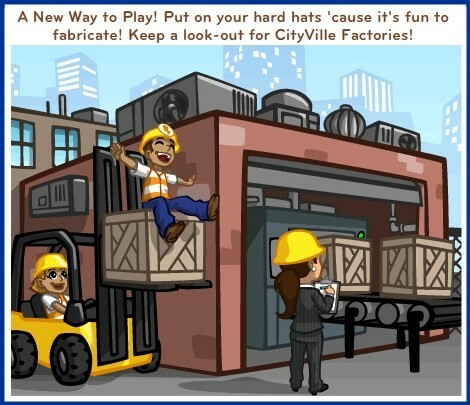 Are you excited about Factories coming to CityVille? What purpose do you think they'll serve in the game? Sound off in the comments. Add Comment.